Biting The Hand That Feeds You: "Me Do It!" 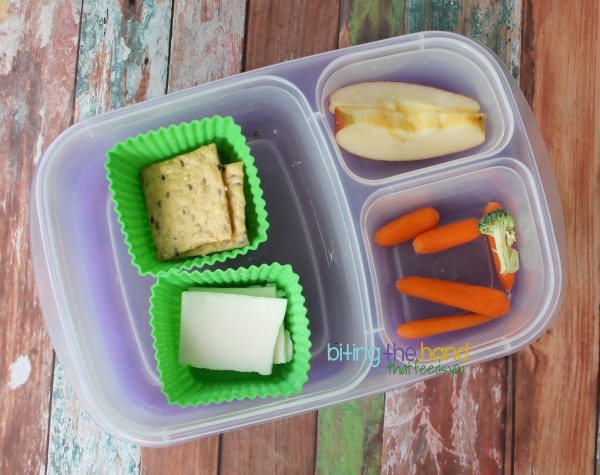 - Lunches Packed by Little Ones! "Me Do It!" 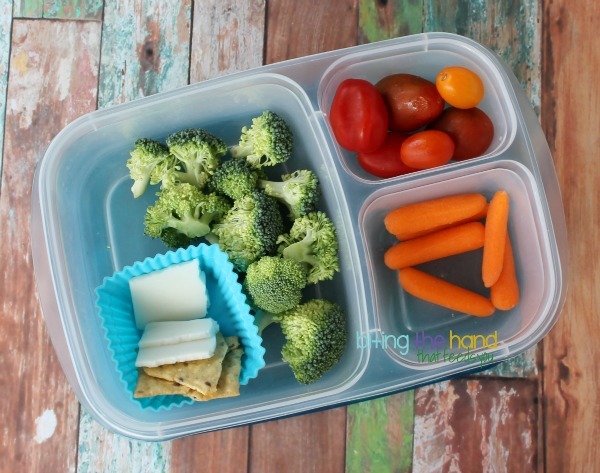 - Lunches Packed by Little Ones! I had a bunch of veggies prepped and was slicing up an apple for lunch when the girls came into the kitchen and started whining that they were hungry. 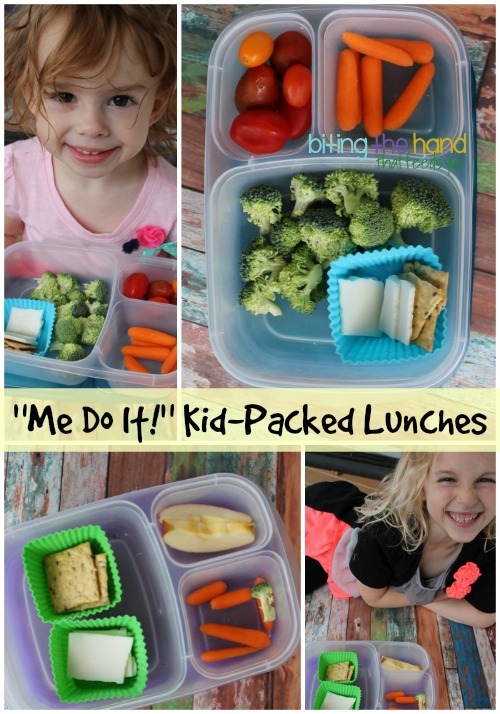 So I asked them if they wanted to pack their own lunches! I gave them an assortment of choices on a big platter and let them build away! 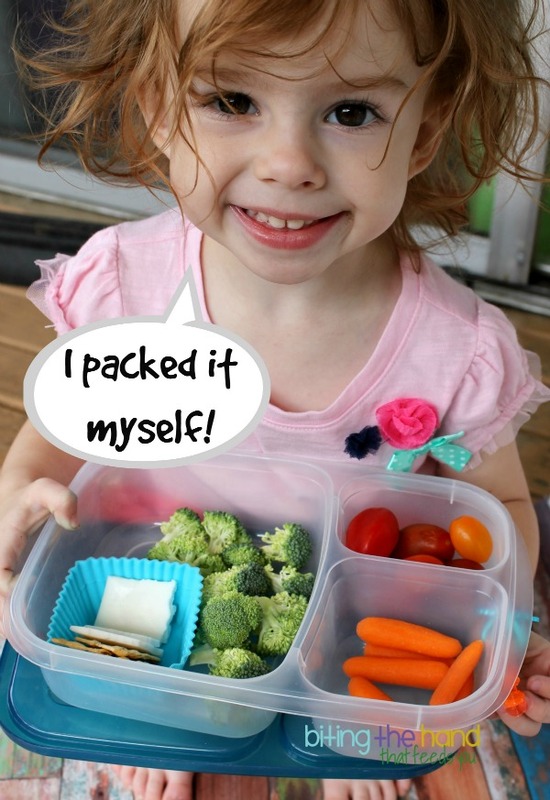 Thursday, 7/3/14 - My 6-year-old packed herself less food than the toddler, but other than encouraging her to pack all four food groups (proteins, grains, fruits, and veggies,) I let her make her own choices. I offered to let them pick mini cookie cutters and make their own cheese shapes, but both girls decided they'd rather just have me fold the slices to break into smaller cracker-sized pieces. Ooookay. Easier for me! But, hey. She was so proud of her lunch, and insisted upon being in the pictures too! Plus she pretty much ate every bite! My 2-and-a-half-year-old went a little crazy on the broccoli, and unsurprisingly, didn't finish it all. And she really wasn't interested in having any apples, which was the fruit I had on-hand. But she packed sooooo many vegetables that I let it slide. My little one insisted upon posing with her lunch as well! Only she doesn't take direction as well, so there's more of my messy back porch in the photo than I'd like! Hahaha! Both girls ate all their cheese and crackers (not a surprise,) but E made a nice dent in her broccoli, and ate all her heirloom cherry tomatoes and most of her carrots too, by the time we got home after our appointment. Not too shabby! 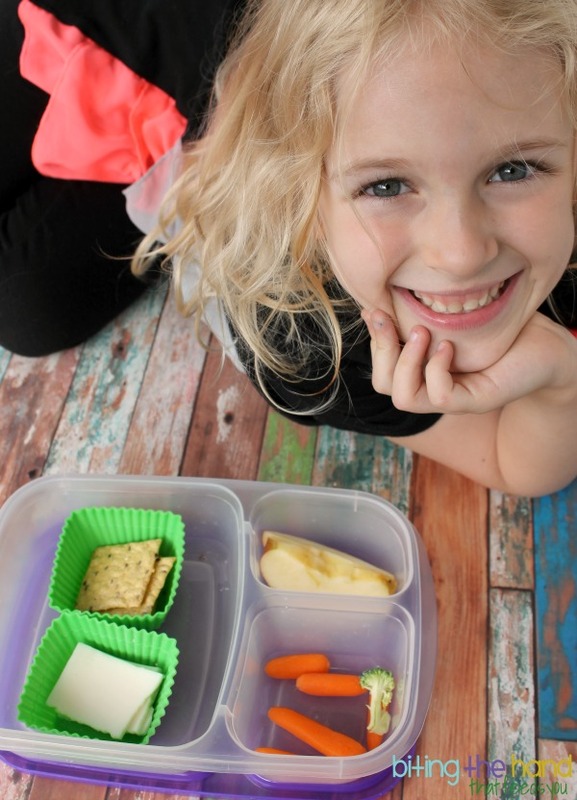 Letting kids help, whether it's prepping, packing, or even just choosing ingredients, gives them a sense of ownership over the meal. Which in turn increases the likelihood that they'll choose to actually eat it! Plus equating food with good fun feelings is never a bad thing!